There are two things that really bother me about this. The first is how little it bothers me, compared to how much I expect it to bother me, and how much other people expect it to bother me. Like seriously, guys. I haven't lost a child. It's just a bike. I'm fine. 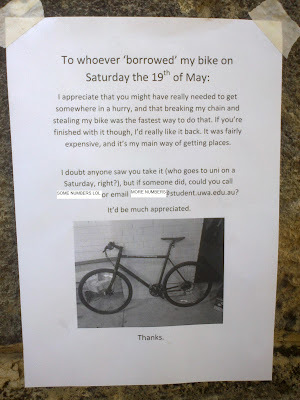 Yes it was a very expensive bike. Yeah, I quite liked it. But it's just stuff. The other thing that bothers me is how much it bothers me. Not so much losing it, but not having it. Having to shape your life around public transport is extremely irritating, especially when you have no easy way to get to stations and such. I imagine that it'd be even worse if I had a car. And, riding to uni each day is actually something I enjoy. I did borrow a spare bike from a friend, but it's just not the same. It's a mountain bike with big fat tires and suspension is like putting on gigantic boots after walking barefoot. I miss being able to feel the road. Okay, I'm actually starting to sound like some kind of nut now.